[S2330] Texas Deaths 1890-1976, made available by FamilySearch.org (Salt Lake City, Utah) on-line at http://familysearch.org, 2014; database courtesy of The Church of Jesus Christ of Latter-Day Saints. [S2363] Texas Birth Certificates 1903-1932, made available by The Generations Network Inc. (Provo, Utah) on-line at www.ancestry.com, 2013; database from the Texas Department of State Health Services. 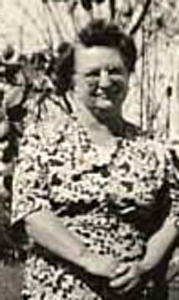 [S3212] Mona Lee, "Powell Family Tree," database made available on-line courtesy of Mona Lee, https://www.ancestry.ca/family-tree/person/tree/72511609/person/48262687728/facts, database viewed 16 Aug 2017. [S16] 1940 (April 1) U.S. Census, San Benito, Cameron Co., TX, ED 31-31, Sheet 30B (back of stamped 504). [S903] Find A Grave - A User-Contributed Listing of Cemeteries and Memorials; Find A Grave Founder Jim Tipton, 2009; online at http://www.findagrave.com/cgi-bin/fg.cgi?page=gs&, Mont Meta Memorial Park, San Benito, Cameron Co., TX. [S2894] Iowa Marriage Records 1880-1937, made available by The Generations Network Inc. (Provo, Utah) on-line at www.ancestry.com, 2014; database from the Iowa State Archives. [S903] Find A Grave - A User-Contributed Listing of Cemeteries and Memorials; Find A Grave Founder Jim Tipton, 2009; online at http://www.findagrave.com/cgi-bin/fg.cgi?page=gs&, Lincoln Memorial Park, Portland, Multnomah Co., OR. [S10] 1880 (June 1) U.S. Census, Garner, Pottawattamie Co., IA, ED 180, p. 16 (back of stamped 24). [S12] 1900 (June 1) U.S. Census, Kane, Pottawattamie Co., IA, ED 136, Sheet 2A (stamped 182). [S13] 1910 (April 15) U.S. Census, Portland, Multnomah Co., OR, ED 175, Sheet 5B (back of stamped 21). [S14] 1920 (January 1) U.S. Census, Portland, Multnomah Co., OR, ED 85, Sheet 2B (back of stamped 234). [S15] 1930 (April 1) U.S. Census, Portland, Multnomah Co., OR, ED 26-202, Sheet 7A (stamped 233). [S16] 1940 (April 1) U.S. Census, Portland, Multnomah Co., OR, ED 37-202, Sheet 7A (stamped 1905). [S15] 1930 (April 1) U.S. Census, Plymption, Multnomah Co., OR, ED 26-231, Sheet 7A (stamped 112). [S14] 1920 (January 1) U.S. Census, Portland, Multnomah Co., OR, ED 84, Sheet 15A (stamped 232). [S1818] Iowa County Births 1880-1935, made available by FamilySearch.org (Salt Lake City, Utah) on-line at http://familysearch.org, 2010; database courtesy of The Church of Jesus Christ of Latter-Day Saints. [S16] 1940 (April 1) U.S. Census, Plymption, Multnomah Co., OR, ED 26-16, Sheet 6B (back of stamped 203). [S12] 1900 (June 1) U.S. Census, Empire, Andrew Co., MO, ED 4, Sheet 3B (back of stamped 39). [S3213] Iowa Delayed Birth Records 1850-1939, made available by FamilySearch.org (Salt Lake City, Utah) on-line at http://familysearch.org, 2017; database courtesy of The Church of Jesus Christ of Latter-Day Saints. [S903] Find A Grave - A User-Contributed Listing of Cemeteries and Memorials; Find A Grave Founder Jim Tipton, 2009; online at http://www.findagrave.com/cgi-bin/fg.cgi?page=gs&, Chowchilla Cemetery, Chowchilla, Madera Co., CA. [S13] 1910 (April 15) U.S. Census, Pleasant Gap, Bates Co., MO, ED 18, Sheet 5A (stamped 215). [S892] Missouri Marriage Records 1805-2002, made available by The Generations Network Inc. (Provo, Utah) on-line at www.ancestry.com, 2007; database from the MO, USA: Missouri State Archives. Microfilm Missouri Marriage Records. Jefferson City. [S14] 1920 (January 1) U.S. Census, Pleasant Gap, Bates Co., MO, ED 19, Sheet 4B (back of stamped 195). [S15] 1930 (April 1) U.S. Census, Rio Hondo, Cameron Co., TX, ED 21-25, Sheet 7A (stamped 183). [S16] 1940 (April 1) U.S. Census, Chowchilla, Madera Co., CA, ED 20-1, Sheet 12A (stamped 12). [S903] Find A Grave - A User-Contributed Listing of Cemeteries and Memorials; Find A Grave Founder Jim Tipton, 2009; online at http://www.findagrave.com/cgi-bin/fg.cgi?page=gs&, newton Union Cemetery, Newton, Jasper Co., IA. [S903] Find A Grave, online, McFarlan Cemetery, What Cheer, Keokuk Co., IA. [S133] "US WW1 Draft Registration Cards", National Archives and Records Administration micropublication, 1917-1918. M1509, 20,243 rolls, Washington DC; on-line at Ancestry.com, accessed through www.ancestry.com. [S13] 1910 (April 15) U.S. Census, Jefferson, Mahaska Co., IA, ED 69, Sheet 7A (stamped 7). [S14] 1920 (January 1) U.S. Census, Bluff Creek, Monroe Co., IA, ED 98, Sheet 10A (stamped 67). [S15] 1930 (April 1) U.S. Census, Washington, Keokuk Co., IA, ED 54-29, Sheet 2B (back of stamped 182). [S903] Find A Grave, online, Oakwood Cemetery, Lisbon, Ransom Co., ND. [S15] 1930 (April 1) U.S. Census, Butler, Bates Co., MO, ED 7-20, Sheet 5A (stamped 136). [S903] Find A Grave - A User-Contributed Listing of Cemeteries and Memorials; Find A Grave Founder Jim Tipton, 2009; online at http://www.findagrave.com/cgi-bin/fg.cgi?page=gs&, Oak Hill Cemetery, Butler, Bates Co., MO. [S13] 1910 (April 15) U.S. Census, Summit, Bates Co., MO, ED 23, Sheet 4B (back of stamped 258). [S14] 1920 (January 1) U.S. Census, Summit, Bates Co., MO, ED 24, Sheet 5A (stamped 235). [S903] Find A Grave - A User-Contributed Listing of Cemeteries and Memorials; Find A Grave Founder Jim Tipton, 2009; online at http://www.findagrave.com/cgi-bin/fg.cgi?page=gs&, Rose Hills Memorial Park, Whittier, Los Angeles Co., CA. [S13] 1910 (April 15) U.S. Census, Summit, Bates Co., MO, ED 23, Sheet 5A (stamped 259). [S14] 1920 (January 1) U.S. Census, Summit, Bates Co., MO, ED 24, Sheet 1A (stamepd 231). [S15] 1930 (April 1) U.S. Census, Bristol, Prowers Co., CO, ED 50-14, Sheet 5A (stamped 236). [S16] 1940 (April 1) U.S. Census, Bristol, Prowers Co., CO, ED 50-12, Sheet 6B (back of stamped 171). [S903] Find A Grave - A User-Contributed Listing of Cemeteries and Memorials; Find A Grave Founder Jim Tipton, 2009; online at http://www.findagrave.com/cgi-bin/fg.cgi?page=gs&, Mountain View Cemetery, Claremont, Sullivan Co., NH. [S14] 1920 (January 1) U.S. Census, Boston, Suffolk Co., MA, ED 590, Sheet 8A (stamped 173). [S15] 1930 (April 1) U.S. Census, Claremont, Sullivan Co., NH, ED 10-7, Sheet 6B (back of stamped 139). [S16] 1940 (April 1) U.S. Census, Claremont, Sullivan Co., NH, ED 10-12, Sheet 3B (back of stamped 155).